Tonight was another time for a post 10:00 PM dinner. We're getting pretty good at this. Because of this I've become a very skilled snacker. It takes a great deal of careful planning and discipline to snack to a degree where I don't overeat and ruin my appetite yet still prevent myself from passing out. I think I've found the snacking sweet spot. Often times, like tonight, I'm not entirely sure when Jen is going to be home so it takes a little more planning. Last night I took some risks by cooking a pasta and medium rare lamb tenderloins ahead of time so we could eat right when she got home. Tonight I played it a little safer. For salad I used up some of the (one of the) MacIntosh apples along with some beets, heirloom tomato, and Cambazola cheese to make a nice little salad with olive oil, salt, and pepper. For the main course you may recognize some (or all) of the ingredients from two nights ago. 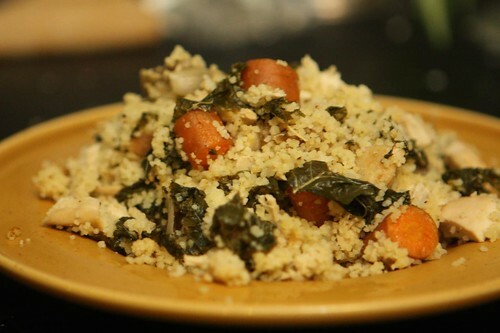 I made this couscous with a little white wine and leftover celeriac, shallot, carrot, garlic, chicken, and kale. For beer I decided to continue my highlight Oktoberfest some more despite my complete lack of culinary compliance. This time I cracked open the Oktoberfest from Hofbräu München. I just hoped it was a little better than the sad, skunky experience I'd had with their lager the other night. Was it better? Yes. 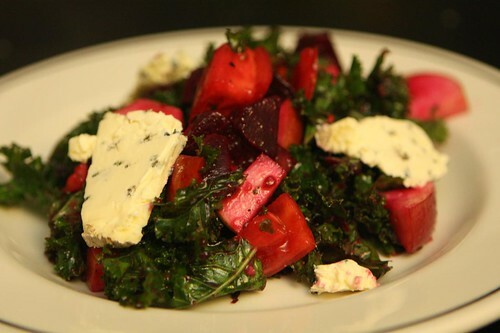 Though it probably has more to do with freshness than anything else. 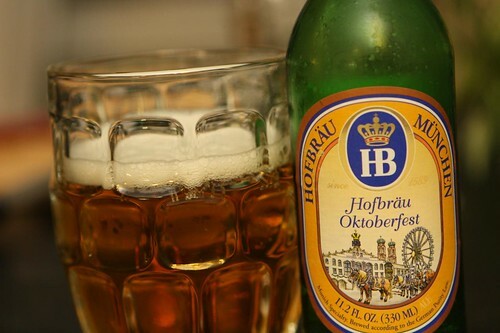 Hofbräu München is a made in accordance with the German Purity Law of 1516 and is made from water, hops, and malted barley. It is brewed to a strength of 5.0% alcohol by weight (6.3% by volume) and a specific gravity of 11.5 to 13.2-3 Plato (1053). It has a nutty character with a distinct chalky finish. I have enjoyed Hofbräu München Oktoberfest in the fall on Munich's Am Platzl at the Hofbräuhaus. There I made note of its malted barley notes and clean, crisp edge. Sorry about that. Apparently I've been reading a little too much Michael Jackson lately.